I recently received a question about whether phenol-formaldehydes would void our attempt at achieving EQc4.4, Low-Emitting Materials, Composite Wood & Agrifiber Products. LEED allows the use of phenol-formaldehydes! Go ahead and use as much as you like. Technically, your composite products can have urea-formaldehydes too, as long as they occur naturally and aren't added. While... phenolic-resin panels are made with binders that contain formaldehyde, they do not release as much of the toxic compound as panels made with urea-formaldehyde binders, and they qualify for use in the LEED Rating System's composite wood credit. Hi, I am a LEED AP practicing in Taiwan. We could not find any no added urea-formaldehyde products help us achieve EQ C4.4. We might need to ask our contractor to import it from US. Does any one know the manufactures? Thanks a lot. Not sure about the availability in Taiwan, but the GreenSpec directory (read my review here) lists 17 different products under the EQc4 credit for fiberboard and particle board. What are your thoughts on Phenol Formaldehyde in batt insulation? Again, the confusing LEED for Schools referenced standard for EQc4 is the Would you think it safe to assume that if it is OK under the LEEDv2.2 standards for composite products that it would also meet the requirements of this ultimately confusing standard for insulation? 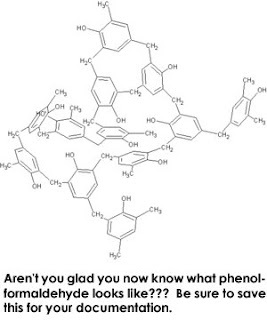 Is melamine formaldehyde permissible as well?